Read measurements on your phone at a safe distance, wearing less PPE while your meter takes the arc blast zone risks, not you. Instantly trend and monitor measurements live on your phone screen for better troubleshooting results. Create and email reports right from the field. When team collaboration is needed use Fluke Connect ShareLive™ video call to share live measurements and discuss next steps with colleagues. Don’t risk transcription errors, save your measurements directly to your meter from your smartphone with the press of a button. Very very nice meter... in this trade for 18years now and this is by far the best meter over ever had.. 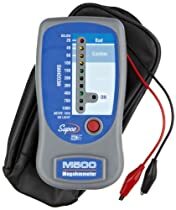 This is the the ultimate go to meter for HVAC/R professionals. Of all the Fluke Connect meters, this serves as the primary. Exactly what I expected. Very satisfied. 5 Stars!